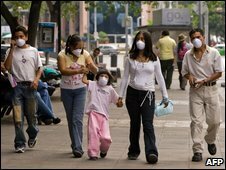 The UK should expect to see cases of swine flu following the deadly outbreak in Mexico, health officials have said. Health Protection Agency chiefs said it was "sensible" to plan for there being cases in the UK because of the way the new strain had spread across America. The government says it has enough flu drugs to treat one in two people, amid global fears of a possible pandemic. Two people are still undergoing tests in Lanarkshire after returning from Mexico with "mild" flu-like symptoms. At least 103 people in Mexico are now suspected to have died after contracting swine flu, with 20 cases also reported in the US and six in Canada. There are also suspected cases in New Zealand, France, Spain, Israel and Australia. However, no-one outside of Mexico has yet died, leading to suggestions that the severity of the cases there may be due to the strain mixing with a second unrelated virus circulating in the community. There are enough anti-viral drugs - such as Tamiflu - to treat one in two of the population. The government has placed orders to double that stockpile. It can lessen the symptoms, and even prevent infection if given to close contacts of an infected person such as family members. When Northamptonshire businessman Chris Clarke returned from Mexico on Saturday with mild flu-like symptoms, he was told to stay at home with his family. After calling NHS Direct, doses of Tamiflu were dropped off for him and his two children. He has since told the BBC that he has been given the all clear by the Health Protection Agency. That will be the typical response if other people return from Mexico and feel unwell. They are asked not to clog up hospitals. It is easy enough to arrange for one family - if 10,000 people need the same treatment it would be a different matter. Professor Steve Field is the chairman of the Royal College of GPs, which heads up research into flu in the UK. He says the coming days will be crucial in assessing the scale of the threat to the UK. He said: "We'll know a lot more... tomorrow and by the end of the week. What we've got to try and do is stop people who've come in from Mexico, places where this is prevalent, going to their GPs and spreading it amongst vulnerable people. That's what's really important this week." Professor Hugh Pennington, who has advised the government on other public health concerns, reiterated the importance of not spreading the virus at GPs surgeries, but also said it was too soon to say how severe the threat would be. He told the BBC: "Until we know exactly what these unfortunate people in Mexico have died from, it's a bit early to say it's a deadly swine flu virus." Swine flu is usually found in pigs and normally contracted only by people in contact with the animals. Health Protection Agency chief executive Justin McCracken told BBC News it was better to assume the UK would be affected by some cases. "I think probably we should expect cases given the way this has spread across America. It is sensible that we plan in the assumption that there will be cases," he said. "We are already mobilising things in the UK in case the virus comes over here. I definitely think we have enough of the drugs." Mr McCracken added: "I don't think at this stage there is any need to declare an emergency." Government officials held an emergency meeting on Sunday under the Cobra system to discuss preparations for a possible swine flu outbreak in the UK. The Department of Health said it had "stepped up" surveillance arrangements and was "actively considering our response in the UK should further action be required". Scottish Health Secretary Nicola Sturgeon said the two patients in Airdrie who visited Mexico had both displayed mild flu-like symptoms but there was no cause for concern. Neither of them had travelled in areas affected by swine flu outbreaks. The World Health Organization rates the UK and France as the two countries best prepared for an outbreak. Health Secretary Alan Johnson said the UK had £500m of flu medication ready. "We have a stockpile of drugs. Tamiflu deals with it once it's started and deals with it very effectively, we know from Mexico," he said. "Once we know what the strain is we will look to find a vaccine to prevent it and we have a pre-agreement for these vaccines to be produced as soon as we decide." The Foreign and Commonwealth Office said people "should be aware" of the outbreak, but it was not currently advising people against travelling to affected areas of Mexico and the US. The advice said: "Cases have been reported in Mexico City, together with the states of Oaxaca, San Luis Potosi, Mexicali and Baja California." Experts say it is impossible to know yet whether swine flu is the trigger for a pandemic - but within 72 hours it should become clear how far the virus has spread.